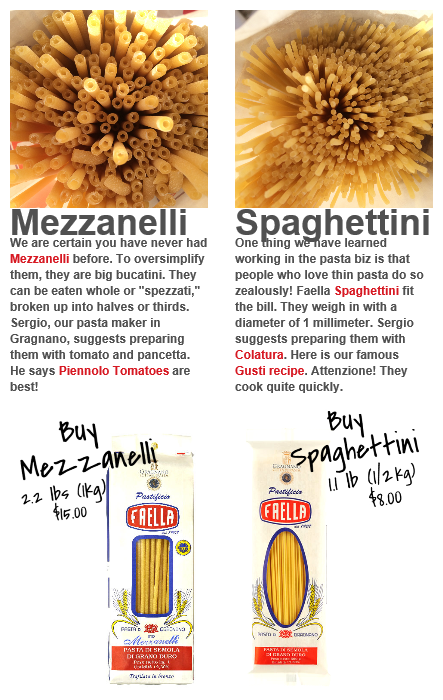 Pasta Faella Presents for their first time in the USA: Mezzanelli and Spaghettini. We are certain you have never had Mezzanelli before. To oversimplify them, they are big bucatini. They can be eaten whole or “spezzati,” broken up into halves or thirds. The other pasta being introduced is Spaghettini, a thinner form of Spaghetti. One thing we have learned working in the pasta biz is that people who love thin pasta do so zealously! Next Post Great News for Pesto Genovese, UNESCO!